"Recently it was announced that Murs and Kidz in the Hall would be embarking on a 36 city tour to support their latest albums, Murs for President and The In Crowd respectively. To support these artists Zune is producing exclusive tour diary podcasts that will allow fans to follow along on the groups journey across America." Following in the grand tradition of past Special Edition Zunes, this most recent batch has got the visual presentation down pat. However, not being a huge fan of either of these artists, I'm going to have to pass. 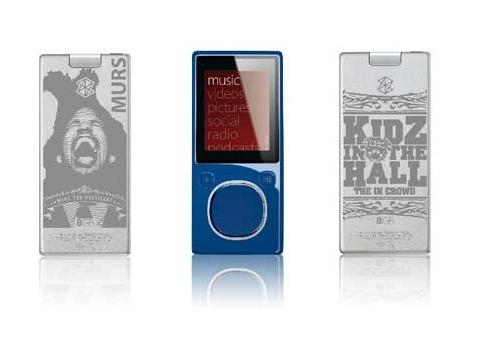 I guess it's probably a good thing I don't listen to a lot of hip music; Otherwise, Zune would be bleeding me dry with all of these special editions. I wouldn't mind, however, an Erykah Badu or Devin the Dude-branded player. How well that'd work out in reality is another question. Is there an artist or group you'd like to see Special-ized?